Aberdeen manager is more interested in adding to his squad than losing players after resisting Celtic’s bid for Scott McKenna. The Premiership champions have ended their interest in the Dons defender after having a £3.5million offer rejected by Aberdeen. Having seen his club rebuff the Hoops McInnes is now focused on adding to his squad before the transfer window closes a week today. McInnes, who has ruled out a move to Pittodrie for former West Brom defender Gareth McAuley, said: “There is possibly scope. When you see the numbers coming back I’m going to have options this weekend for the first time defensively in the league and I think we have a strong squad. 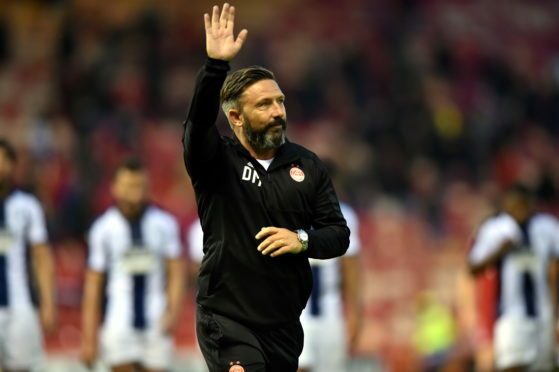 The Dons boss is pleased McKenna remains part of his squad at Pittodrie following Celtic’s interest and while McInnes is resigned to the Scotland international moving on he has reiterated his belief McKenna’s best route to the top of the game is with the Reds. He said: “I was always quite relaxed about it but I’m delighted to have him still here. “He has got more caps to earn and more to achieve with Aberdeen before he eventually goes as there is an inevitability about the fact that he will move. “We have all been in the game long enough to see when a good player comes along and somebody is made of the right stuff. “Scott is the real deal and he will go at some point as he is someone who is doing very well and will continue to get better. “He’s been kept abreast of everything this week and he’s fine with it and understands the situation. “He’s got ambitions but his ambitions are with us at the minute and there will be a time when he goes to fulfil his next set of ambitions. “But I wish there could be more like him as he is an absolute star of a boy as you couldn’t meet a better lad. While McKenna is focusing on recovering from a hamstring injury the Dons are waiting to discover how long Danny Rogers will be out for. The goalkeeper, who is on a season loan at St Mirren, was stretchered off with a knee injury in Saints’s Reserve League match on Monday and McInnes fears his absence could be a lengthy one.